Myriam Kamel’s short student film MY BROTHER shows promise as a serious, thoughtful entry into the complexities of emerging immigrant generations caught between family and modernity. In the story, two brothers, Youness and Omar (played by Hamza Tabaichount and Fayçal Azzouz, respectively) have left their families to seek out opportunities in an unnamed, Western city. While Youness has broken from tradition now that he is separated from his family and culture, Omar continues to go to school and walk the path that his parents intended. 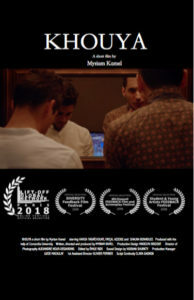 The two brothers unspoken tensions become explicit, however, on the eve of their parents’ visit, when Youness wants to introduce his parents to his girlfriend. Kamel’s success lies in her steady, almost motionless camera, which allows the characters to show their complicated and wavering emotions. Youness’s attempts at rebellion seem small (wearing a collared, patterned button-up shirt instead of a white one), but the glances of disapproval through the mirror speak volumes. It’s a credit to Kamel that the film is as controlled as it is; its slow, cinematic tension matches the fractious relationship between the two brothers. The film’s sparse dialogue and few scenic changes allow Youness’s struggles to be internal, almost invisible. In this way, the gesture of tying a tie or adjusting a collar takes on a far greater significance than it usually does. The film’s struggle may only with Omar, both in the sense of how he is written and how is portrayed. Perhaps through no fault of his own, Azzouz seems to be the wrong man for the part, his charismatic good looks and contemporary haircut make it seem like he’s the one getting ready for the club. It may be, however, that Omar is underwritten, and his only attribute—conservatism—makes it harder to see him as a character and more a foil for his brother’s familial struggle. At one point, when Youness says “you’re just angry because I make more money than you,” the viewer gets the sense that the film could explore why the conservative elements dislike the emergence of individualism within their own families. A more emotionally rich Omar could explore that point more forcefully. Despite this, Kamel’s film is a rich foray into the emotionally complex world of the younger generation as they attempt to chart a reasonable path between traditionalism and modernity. In exploring these struggles using intimate situations, the film allows us to think about these struggles as real emotional battles instead of ideological paradigms.